The knees are often the most easily injured part of the body. The knee is our bodies largest and most complicated joint, and it is used for everything from standing up, sitting, to walking, running, etc. It’s a weight-bearing joint that straightens, bends, twists and rotates. As is the case with the shoulder joint; increased mobility often comes at the sacrifice of stability. With all the motion available in the knee joint your risk of acute or overuse knee injuries are common. Acute knee injuries (including torn ligaments and torn cartilage) are often caused by awkward twisting or falling. There are many sports that may cause you to encounter such movements on a frequent basis, especially sports that involve running and jumping and sudden stopping and turning, such as soccer, basketball, volleyball, tennis, and baseball, as well as contact sports such as football, wrestling, and hockey. But more common than sudden knee injuries are injuries caused by overuse or overload. Overuse knee injuries (including muscle strain, tendonitis and bursitis) often emerge gradually over days or weeks. Pain is frequently mild and intermittent in the beginning but tends to worsen over time. When we stress our muscles and tendons even slightly beyond their capabilities, microscopic tears occur. Inflammation, which is part of the healing process, is what causes the pain. It is when a person trains again before these injured tissues have had a chance to heal that an overuse injury may occur. It is always advisable to seek early treatment for overuse injuries to prevent chronic problems. Knee pain is commonly caused by doing too much too soon. If you haven’t exercised for a long period of time – especially high-impact aerobics; walking, running or jumping on hard surfaces or uneven ground; excessive running up and down stairs you are at a higher risk of injury. In fact when you walk upstairs you are putting pressure on your knees that is equivalent to four times your body weight, and if you up your speed to running up the stairs it can be eight times your body weight. 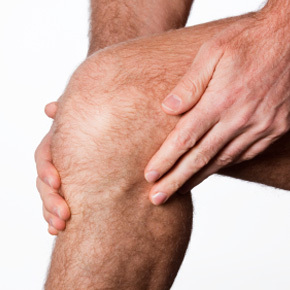 Knee osteoarthritis (often described as age-related degenerative change) is a common cause of knee pain. The risk increases with age. Osteoarthritis is a form of arthritis involving degeneration of the cartilage end-plates of the bone. In such cases exercise is vital to maintain strength and flexibility of the muscles supporting the knee, which reduces the stress on the knee joint. People with knee osteoarthritis may also need to take pain medications and/or other complementary pain treatments such as glucosamine sulphate and chondroitin. Runners’ knee (also called patellofemoral pain or anterior knee pain) is a very common cause of knee pain in young people (not just in runners). The pain is usually located behind the kneecap and symptoms often worsen after climbing or walking downstairs, jumping, running, or after a period of sitting. This condition is caused by poor tracking of the kneecap however appropriate exercises prescribed your osteopath are essential in correcting runners’ knee. It is also important to be assessed for “flat-feet” as these are known to cause a mechanical strain relating to Runners knee. It’s important to stay away from high-impact activity if you have this condition. To prevent knee pain one must start by keeping the muscles that support your knees strong and flexible. Begin slowly. The old saying “walk before you run” holds truth here. Before you engage in a strenuous high impact activity such as jogging or running, try walking for a week. If walking causes knee pain, you shouldn’t be running. It is important to warm up and stretch before working out and after intense exercise always give your body some time to recover. For instance, if you do high impact activities take every other day off and avoid running up and down stairs and doing full squats. Doing knee exercises to strengthen and stretch the muscles that support the knee are vital for knee pain and injury prevention. Proper footwear is also important, especially if walking or running on hard surfaces. More straw on the camel’s back doesn’t help matters so keep your weight under control. Reducing one’s weight reduces stress upon the knee.